With 15 days left in the regular season, the playoff races in each conference simply are on fire. Almost every game has added significance, with points at such a premium, as teams jockey for positioning. 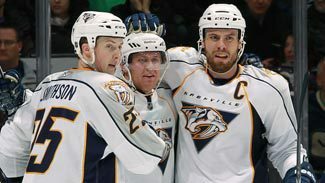 NHL.com is here to give you a Down the Stretch daily that will highlight what you need to know about the games that directly can impact the playoff races. Where they stand: The Bruins are third in the East; the Flyers are first in the East. What's at stake: As Philadelphia tries to hold off Pittsburgh and Washington for the top seed in the East, the goal for Boston Sunday is clear -- win and the Bruins will have clinched a spot in the postseason field. How it's going: The Bruins lost to the Rangers 1-0 Saturday afternoon in the finale of a three-game homestand, but won the first two games of that stay by a combined score of 11-1. The Flyers knocked off the Islanders 4-1 Saturday courtesy of James van Riemsdyk's first NHL hat trick. It was Philly's first regulation win in five games after going 1-3 in four consecutive shootouts. Upcoming: After Sunday's trip to Philadelphia, the B's will come back home for another three-game stay at TD Garden against Chicago, Toronto and Atlanta. The Flyers go to Pittsburgh Tuesday before coming home Thursday to host the Thrashers. The Preds get a well-deserved day off Sunday after topping Dallas 4-2 Saturday night. The win was Nashville's sixth in a row, putting them a cushy five points clear of ninth-seeded Calgary. After starting March on fire, the Habs are making like the weather and leaving like a lamb. Montreal has lost three straight, leaving it in danger of dropping all the way to the eighth spot in the East. Where they stand: The Panthers are 14th in the Eastern Conference; the Penguins are fourth in the East. What's at stake: Florida is far from the playoff chase at this point and Pittsburgh has already punched its ticket to the postseason, but a division title and the No. 1 seed in the East isn't out of the realm of possibility for the Pens, who trail Philadelphia by just four points. How it's going: The Panthers have continued to struggle, going winless in four straight and losing the first three games on their current five-game road trip. The Penguins haven't gotten the job done in 60 minutes this week, but that suits them just fine. Pittsburgh has won its last three games, each by way of the shootout. Upcoming: Florida finishes its road trip Tuesday in Columbus and returns to Sunrise for two games next week against Ottawa and again with the Penguins. The Penguins host Philadelphia in a huge showdown Tuesday night before hitting the road for a pair against Tampa Bay and Florida. Where they stand: The Canucks is first in the Western Conference; the Blue Jackets are 12th in the West. What's at stake: Columbus' 11-point deficit to make the postseason is likely too large to overcome, but the Canucks have plenty to play for as the season winds down. The Canucks have already clinched the Northwest Division, but with the League's best record, the Presidents' Trophy and home ice throughout the postseason could still be in the offing. How it's going: Vancouver's No. 1 record is no fluke and even with a division title already sealed up, the Canucks are playing like the chase is still as furious as can be, having won nine of their last ten games. The Jackets' 3-0 loss to Phoenix Thursday night was their third in a row. Upcoming: The Canucks finish a four-game road trip in Nashville Tuesday before coming home to face the Kings and Oilers next week. Columbus hosts the Panthers Tuesday before leaving for a brief visit to Washington Thursday night.